Browse Artists and Groups Randolph S. Hewton, R.C.A. 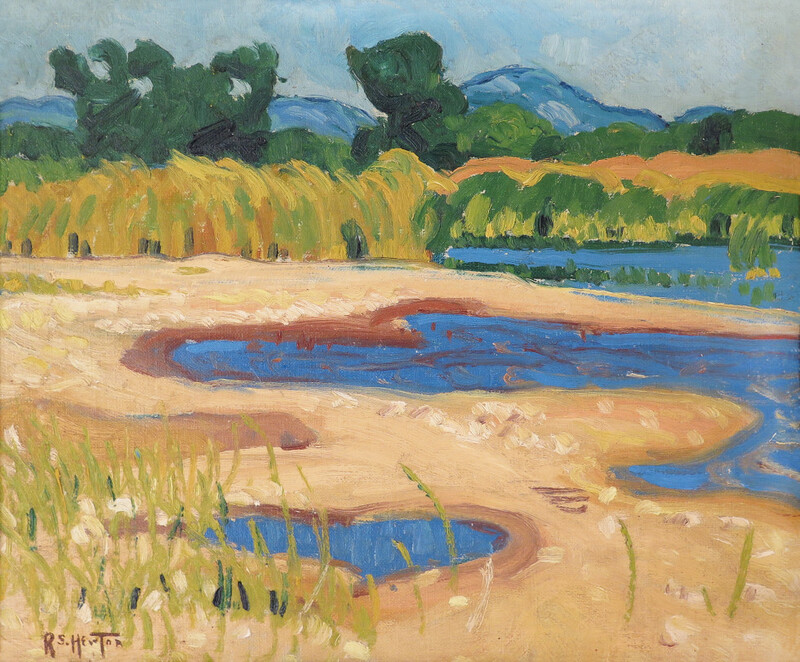 Randolph Hewton's first art training was with William Brymner at the Art Association of Montreal, where he won the Wood Scholarship. With the assistance of some good friends in Lachine, Quebec, he was able to study in Paris for several years, and for a short time at the Academie Julian and later under Henry Caro-Delvaille. Hewton loved Paris and I think would have been content to live there permanently. I met him there in 1912 as I was painting around Etaples and on my visits to Paris I stayed with him. We returned to Montreal in about the same time and in the spring of 1913, put on an exhibition together in the new Art Gallery on Sherbrooke Street. While we were not very radical we were exponents of French Art which was not popular at that time in Montreal. It was not a successful exhibition—a friendly notice in the Montreal Gazette, Hewton's aunt bought a sketch, the only sale. I was advised by one of the older Academicians to give up art. Hewton had to go to work in his uncle's firm. We had a last fling at sketching in Emilieville, where we rejoiced in the glory of the Canadian spring. I went to Toronto and became associated with the artists who later formed the Group of Seven. By the end of 1914, Hewton had enlisted in the 24th Battalion. I joined up a few months later in the 60th. I remember some of the boys saying: "Poor Randolph! They will never make a soldier out of him." Randolph was a social being, a charming personality, interested in music and literature and above all, painting. He was not keen on army life, occasionally we met and exchanged views, of which the higher-ups would not have approved. Hewton was transferred to the British Army and obtained a commission in the 7th London Regiment and won the Military Cross for gallantry on the Somme offensive in 1918. He obtained a week's leave after the armistice, found some wrapping paper and crayons and made some vigorous drawings of the messed up country. Back in Montreal, there was little interest in art. He exhibited in the first show the Group of Seven put on and became an Associate of the Royal Canadian Academy in 1921, and the same year was appointed Principal of the School at the Montreal Art Association. This school was closed after the École des beaux-arts was opened. So back to the paper box business. In 1926, he became president of Miller Brothers. He was married to Isobel Monk (nee Robertson), a war widow. In 1933, the office of the company was moved to Glen Miller, Ontario where the mill was situated. Officers of the company assured me that Hewton put new life into the business, had the mill and company houses painted in cheerful colours, improved working conditions and was popular as well as efficient. For an artist to take on such responsibility was a problem. 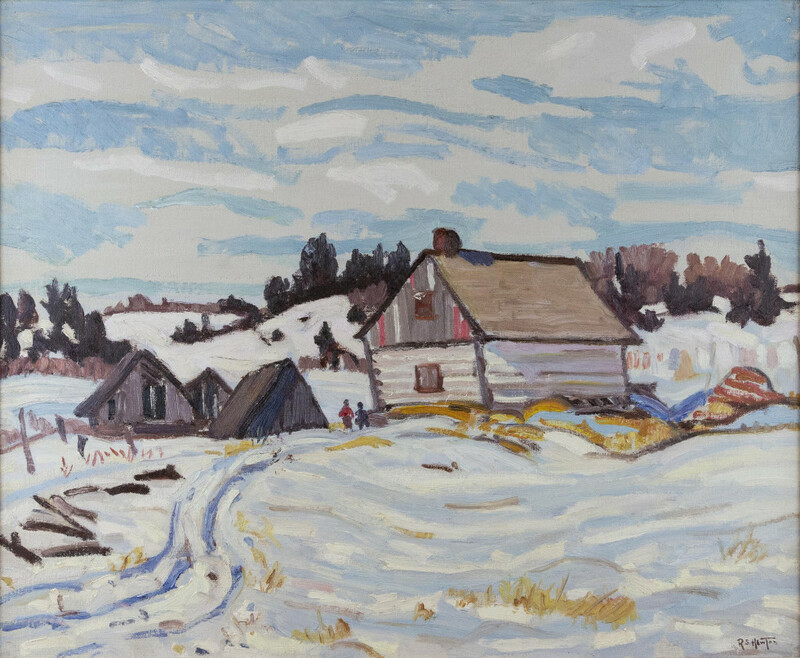 He arranged to take time off in the early spring to go sketching in Baie-Saint-Paul, Saint-Tite-des-Caps and Les Éboulements, often with Albert Robinson and myself. In the spring of 1933, Hewton and I had gone to Saint Urbain and Robinson was to join us later. A letter informed us he was ill, indeed so ill that he never went sketching again. Another enthusiast was Dr. Banting. He, Hewton and I went to Saint-Irénée. Lots of snow and sunshine and a lot of spoofing between Hewton and Banting about how they each won the Military Cross. Later we found the Gatineau easier country to access. I had introduced Hewton to Dr. Fred Jeffrey and his wife and they became close friends. The doctor had a cottage forty miles north of Ottawa and with Maurice Haycock we had sketching parties there. Hewton painted two canvases a day out of doors. He developed chronic bronchitis and could no longer work out of doors, then the long illness and with the death of his wife he had not the strength to paint anymore. Several of his pictures have been purchased by the National Gallery of Ottawa (now the National Gallery of Canada), the Quebec Provincial Museum (now the Musée national des beaux-arts du Québec) and the Art Gallery of Hamilton. He was elected member of the Royal Canadian Academy in 1934. Apart from his landscapes and portraits he painted decorative compositions, gay and romantic and charming in colour. Renoir was probably the painter he most admired. When he first exhibited in Montreal he was considered radical. He stirred the academic painters by serving on the Canadian jury for the Wembley Exhibition. That he did so much good work under such difficult conditions is remarkable. If he felt frustrated at times he never showed it. He was a good companion, friendly, sympathetic and generous in his estimate of others. Source: Randolph Hewton Retrospective Exhibition Catalogue, Galerie Walter Klinkhoff (1962). Written by A.Y. Jackson. To add this limited edition catalogue to your collection, please contact us. © Copyright AY Jackson and Galerie Walter Klinkhoff Inc. Please send me more details about the following artist. Randolph S. Hewton, R.C.A. signed with Estate stamp signature, "R S Hewton." (recto, lower left).